A comprehensive eye exam at Portland Eye Care includes a prescription for eyeglasses and a thorough evaluation of the health of your eyes. After your eye exam with Dr. Adelman there is time for discussion regarding any preventive care for eye health issues and recommendations to keep you seeing your best. All data and images from your eye exam are archived in our state-of-the-art electronic health record system, allowing the doctor to easily compare findings over time in order to identify trends and changes in your eye health. This ability is especially important for the care of your eyes because many ocular diseases and disorders have few or no symptoms until they are quite advanced and difficult to treat, but they can often be diagnosed and treated early by comparing objective values and images over time. 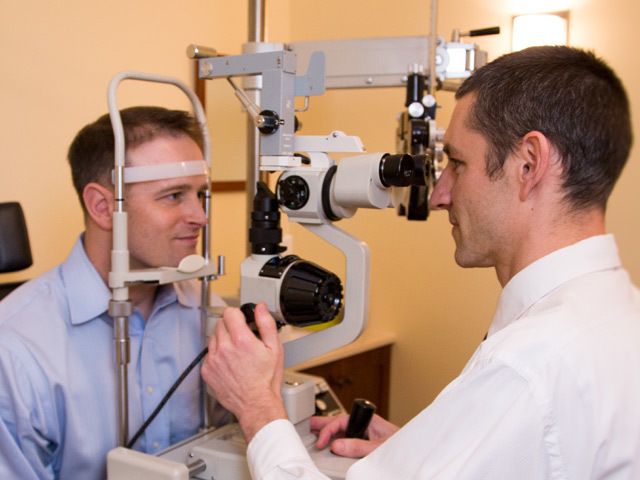 Additionally, the records of your eye exam at Portland Eye Care can be electronically sent to your primary care provider or other specialist, which is especially important if you have a systemic condition that affects the eyes such as diabetes. We have found that some patients coming for their first eye exam at Portland Eye Care are nervous about getting an eye exam because of the “air puff” test they have had at other optometry offices. We are proud to say that we do not use this older technology in our office as we are fortunate to have technology for monitoring eye pressure that is not only more comfortable than the “air puff,” but is also more accurate. We have invested in the I-Care tonometer, an instrument developed in Finland that measures your eye pressure without the puff. We recommend getting an eye exam every year (or more frequently if you have an ocular condition, or a systemic condition that affects the eyes). This annual eye exam is especially important in children as their visual system is developing and changing, and people over fifty as there is an increased risk of ocular disease past this age. We reserve plenty of time for your eye exam, so while you should expect your exam to take just about half an hour, there is plenty of time for any questions or concerns you may have during and after your eye exam. We want you to be comfortable and enjoy the process as we help you see better.